To keep the example simple, let’s say we wan to build an API (script) that takes a developer’s name returns a greeting and also returns the time when the greeting occurred. It’s basically your HelloWorld example. When the script editor opens, on the left-hand side is the area to write the script and on the right-hand side is the area where you can test the script (you can hide either area by clicking Hide Editor or Hide Test buttons). Let’s look closer at the script. The 2nd line creates a greeting string. The 3rd line uses Moment.js library to get the current time. 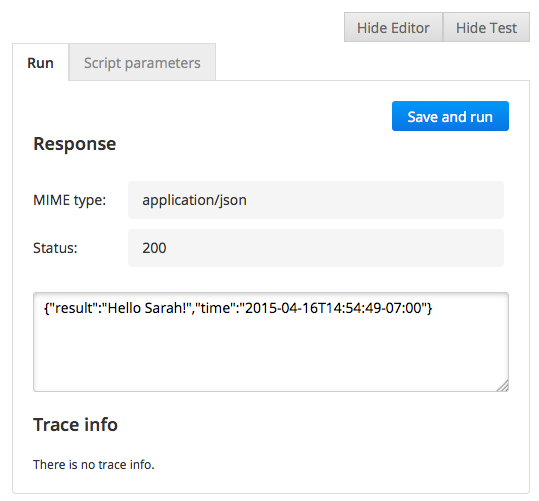 The 4th line returns the response in JSON format. This is the REST API service response. 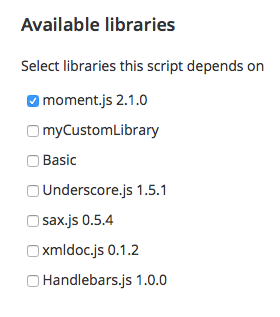 You might be wondering how can we use Moment.js if the library is not loaded/referenced anywhere? In addition to writing scripts, you can also use libraries. 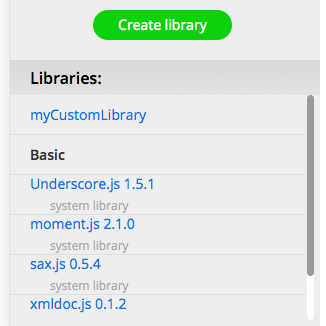 You can load an existing 3rd party library or you can write your own library. Then you can make the script be dependent on one or more libraries. 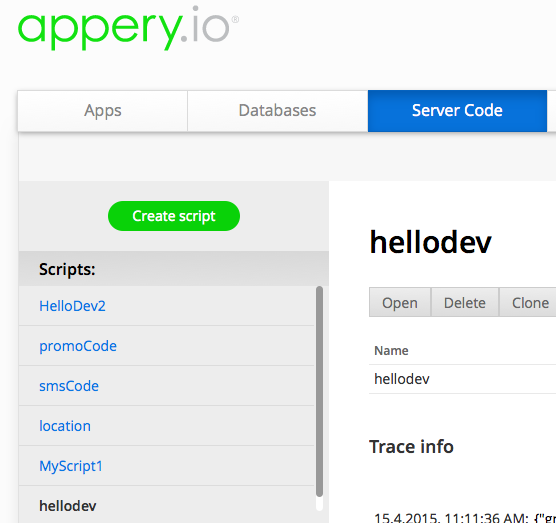 The script is simple and the logic is instantly exposed via a REST API. There is nothing extra you need to do. Just write the script logic. 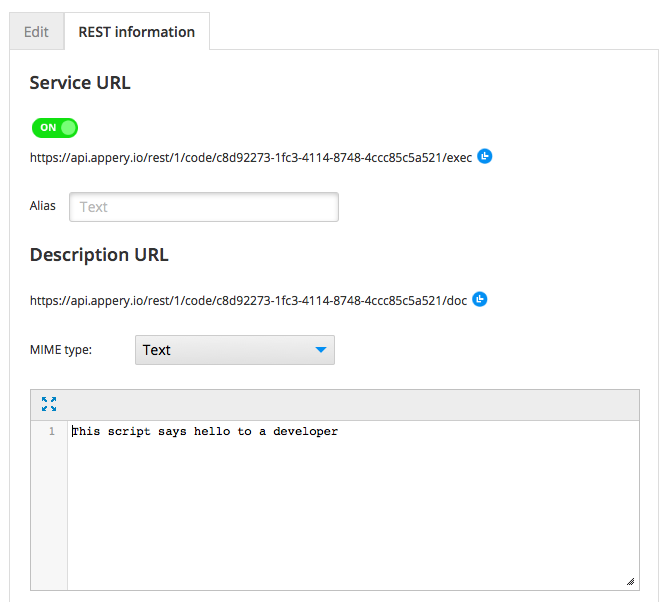 The beauty is that you just built a new REST API. The Service URL section shows the end point you can use to invoke the service. Optionally, you can also give the script an alias. The alias will replace the script id in the URL. The Description URL is an end point to service documentation. 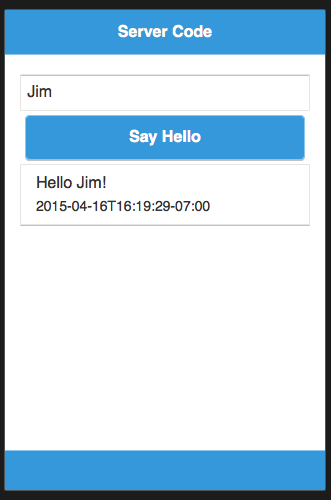 If someone wants to learn what the service, they cna invoke this API to get information about the service. Before using the service in an app you want to test the API. That’s easy to do. 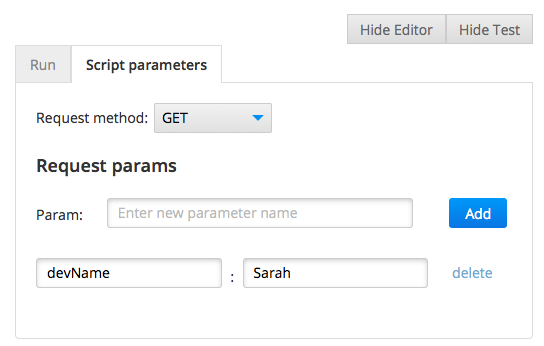 On the right-hand side you will see two tabs: Run and Script parameters. Clicking Save and run button invokes the script and shows the result. Now that you know the script works, it’s time to use the API.